This week I have worked on the Otto animation. I started out making a sketch of the turtle in Photoshop, and then animated the sketch into a walk cycle. This was done in order to see that the movement flowed the way I wanted it to, before continuing on to animating the turtle in a more detailed state. 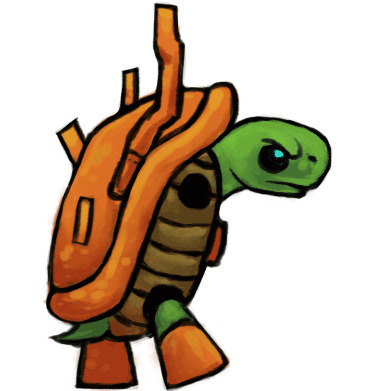 As the turtle is both old, is supposed to be scary, and make noise when he walks (for the player to hear and respond to), I wanted to make his walk kind of choppy and non-smooth. Therefore, after completing the first walk cycle and noticing that the walk ended up too smooth, I had to reduce the amount of images in the animation. I removed some in-between steps to achieve the right feeling in the movement. I also altered his facial expression compared to the earlier sketches, and made his eyes bigger and angrier with exaggerated eyebrows, in order to communicate his angry personality clearly to the player even though the character himself is pretty small on the screen. I left out Otto's arms in the original animation, as I find it easier to animate them at a later stage, as separate objects. At the moment the arms still need some work, and therefore I have chosen not to include them in the GIF. After the animated sketch of Otto was done, I started doing a more detailed version of the line art. When one movement phase was done, I used that layer and copied it with transformations applied to the other layers in order to save some time, and also to make sure that the details looked the same and had the same proportions in all the pictures. However, transforming a layer made the lines kind of ragged and pixel-y in the edges, so some smoothing-out was required before they looked good again. After that, I used an earlier sketch of Mr. Von Fancy as a reference for picking colours. Again I used one layer in Photoshop for the colours, and copied it to the other layers with some transormations. When one full colour and line-art walking cycle was done, I flipped the image horizontally to make an animation for walking in the other direction. Some changes had to be made to the shell of the turtle, as it is asymetrical in its details. Just like in the previous steps, I made one shell picture that I copied and used for all the layers. I understand some of your workflow by reading this blog but I feel that you could have gone into more detail. But let's start with the good. I understand why you choose to animate a sketch before you move on to a detailed character animation. I also got a pretty good picture of the shortcuts and methods you used to take the sketch to a finished product. You also clearly explain why you opted for larger facial features in order to make the character's expressions more discernible. While I do understand that being an old and grumpy turtle you do not want Otto von Fancy moving all too smoothly, I didn't quite understand your reasoning regarding why the animation you decided upon was "right". Did you study the walk of old people or old turtles? Was there any special reason for why you settled upon Otto von Fancy's current, shambling gait? It would also have been good to have been able to read about why the character is a turtle as well as the thought process behind that decision. And I would have loved to know how you propose to express his fanciness with your design and animation. It would have been great to read more on why you chose to animate the arms separately and why that is easier for you. It would have been interesting to have seen them included in a GIF here to be able to track your progress. I hope to be seeing you return to the subject of Otto von fancy - the angry turtle, at a later date! All in all I do feel informed by your blog, but it would have been great to read a more detailed account.